Welcome to the CrystFEL tutorial! This tutorial covers most of the main steps of using CrystFEL, and is based on processing some freely available LCLS data. The aim of this page is to give an overall idea of how the programs fit together and equip you with the knowledge you need to get started with processing a serial crystallography data set on your own. The estimated time required to complete this tutorial is about three hours, provided that everything is already installed and the data set has already been downloaded and unpacked (the downloading and unpacking is described in step 1, the installation is described on a separate page). Step 10, in which the entire dataset is processed, is the most time-consuming and may push the required time higher if a fast computer is not available. However, once you've started the processing, you can leave it alone until it's finished. You'll need CrystFEL version 0.6.0 or higher to follow this tutorial, with some steps needing a more recent version. You'll also need MOSFLM installed, because this tutorial will use it for indexing the patterns. Check the installation guide for instructions. Familiarity with a Unix command line environment is assumed. cxidb-21-run0130.tar is the file which was used below, but you needn't download the entire of any file - just cancel the download after a few hundred megabytes, and you should still be able to unpack the files contained in the partially downloaded file. Yes, SFX data sets are big ... ! CrystFEL can read data in CBF of HDF5 format. HDF5 format can organise the data in a variety of different ways. For the dataset suggested here from the CXIDB, there is one HDF5 file per frame of data, so things are quite intuitive. However, perhaps you are going through this tutorial with a different dataset. Newer datasets might consist of a smaller number of larger files, where each one contains many frames. In this case, the file with the real data will almost certainly be the largest file in the data folder, probably with extension .cxi. Don't worry about the differences in file format, though - apart from a few small things, CrystFEL takes care of it! Many recent X-ray detectors, particularly those in use at FEL facilities, consist of many small panels. Take a look, for example, at this photo of the CSPAD detector used at the CXI endstation at LCLS, where the 5HT2B data was collected. The CrystFEL "geometry file" tells CrystFEL everything it needs to know about how the detector is laid out physically, as well as how the data is laid out in the HDF5 file - whether there's one frame per file or many, where to find the photon energy/X-ray wavelength, and so on. Save the file to your working folder. You'll probably need to use "Boost Intensity..." (in the "View" menu, or press F5) to be able to see anything: try a value of 5 for a start. Experiment with "Set Binning..." (also under "View", or press F3) and "View Numbers..." (under "Tools", or press F2, then click somewhere in the image to see the actual numbers in the image data). You should also be able to plot resolution rings using View->Resolution Rings (or just press F9). Some simple HDF5 layouts can be viewed without a geometry file (just omit -g 5HT2B-Liu-2013.geom in the command above). If you're using data which has an individual HDF5 for each frame, give this a try. You'll see the detector panels rearranged into a more compact pattern, which is the way the data is actually laid out in the file. The geometry file tells CrystFEL how to put the panels together properly. The central program in CrystFEL, indexamajig, works in a batch mode processing many files with one invokation. You must prepare a list of files for it to process, which we'll call files.lst. A good way to generate this file is to use find. Having done that (look at the example below if you don't know how), use head, or your favourite text editor, to examine the list to check it's worked correctly. You can also use wc -l to see how many files you have — 5775 in this example, but you might have more or fewer depending on which file you downloaded from the CXIDB. Note the careful use of selection criteria in find to exclude some of the other HDF5 files which came with the data from the CXIDB, such as the bad pixel maps, gain calibration files and so on. Note further that 5775 is not a huge number of patterns, probably not enough to solve the structure. Normally, about ten thousand good quality patterns would be required, with the exact number depending strongly on the quality of patterns and the symmetry of the structure. Nevertheless, this list of images will be suitable for demonstrating the principles involved, and allow the steps of the tutorial to be performed in a reasonable amount of time. If you want to go further and try to generate electron density maps at the end of the tutorial, you could download all of the 5HT2B data from the CXIDB — and wait a lot longer for each processing step to complete! If you're using multi-image files, the search criteria might be different. For data files from SACLA, you should change LCLS*.h5 to run*.h5, and for files from recent versions of Cheetah you should use *-class1.cxi (note that things get a bit more complicated for time-resolved experiments, so be careful). Obviously, if each file contains more than one frame then the list of files will be much shorter and will not be the actual number of frames to be processed. indexamajig knows to automatically process all of the frames in each file. If this isn't what you want, there is a tool called list_events which you can use to create a list containing each individual frame in the files, but you don't need to worry about that for now. These HDF5 files were written by Cheetah. 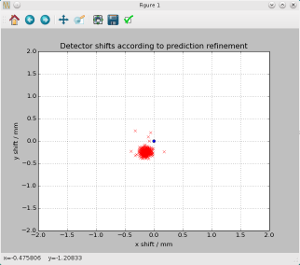 Cheetah is a hit-finding program which locates candidate crystal diffraction patterns by searching for peaks (hopefully Bragg peaks) and requiring a certain number of them. Conveniently, Cheetah stores its list of peaks along with the image data in the HDF5 file. This section describes how to extract and view the peak information. Section 6 will describe how to search for peaks "ab initio" using CrystFEL's built-in peak search methods. For a real data set, you only need to do one of these steps! Since accurate hit-finding in Cheetah relies on good peak detection, provided that the hit finding results are satisfactory it's likely that Cheetah's peak lists are pretty good. Therefore it's usually better, not to mention quite a lot easier, to use Cheetah's peaks, and only fall back on CrystFEL's algorithms if there are problems. WARNING: You did not specify --int-radius. WARNING: I will use the default values, which are probably not appropriate for your patterns. 0 indexable out of   13 processed ( 0.0%),    0 crystals so far. 13 images processed since the last message. 0 indexable out of   28 processed ( 0.0%),    0 crystals so far. 15 images processed since the last message. 0 indexable out of   42 processed ( 0.0%),    0 crystals so far. 14 images processed since the last message. 0 indexable out of   56 processed ( 0.0%),    0 crystals so far. 14 images processed since the last message. 0 indexable out of   70 processed ( 0.0%),    0 crystals so far. 14 images processed since the last message. If you're using multi-frame files in "CXIDB" format (filename ending in .cxi), replace --peaks=hdf5 with --peaks=cxi, because this type of file contains the peak information in a slightly different format. In this case, you should make the same substitution everywhere else you see --peaks=hdf5. For this initial step, you needn't wait for indexamajig to finish processing all the patterns, so press Ctrl+C to interrupt it after about 50 images (which shouldn't take long). You just need enough processed images to see whether the peak detection is working properly or not. Note also the warning messages which appeared right as indexamajig started. At this stage, these messages can be ignored — they will only become important when we move on to the later stages of processing. Now, use the check-peak-detection script to visualise the results. This script will run hdfsee on each image in turn, but this time there will be circles around the detected peaks. After you close the window, the script will open a new instance of hdfsee with the next image. To stop this cycle, press Ctrl+C in the terminal from which you ran check-peak-detection. The check-peak-detection script can be found in the scripts folder in the CrystFEL distribution. Alternatively, you can download it from this site. After downloading this script (as well as the other ones later on in the tutorial), you may have to mark it as executable using chmod +x check-peak-detection. As input, it takes the stream output from indexamajig in the previous step. Any other arguments you specify (apart from --indexed and --not-indexed which will be discussed later) will be passed to hdfsee. For example, you could specify a geometry file or intensity boost factor — run man hdfsee for a full list of possibilities. You are encouraged to edit the script in a text editor to add your own default arguments so you don't have to type them in every time you use the script. If the HDF5 peaks looked OK, then you can skip this step. "OK" here means that the peaks which were found all look like real Bragg peaks to you. You can recognise this because they should appear in what looks like some kind of regular pattern, with reasonably even density of peaks from the centre of the pattern up to some resolution limit (usually not all the way to the edge of the detector). If the peak detection is not OK, this step describes how to repeat it using CrystFEL's built-in peak search methods. The accuracy of the peak search is one of the most critical factors in the success of the indexing process, so don't rush this step! 0 indexable out of   14 processed ( 0.0%),    0 crystals so far. 14 images processed since the last message. 0 indexable out of   29 processed ( 0.0%),    0 crystals so far. 15 images processed since the last message. 0 indexable out of   45 processed ( 0.0%),    0 crystals so far. 16 images processed since the last message. 0 indexable out of   60 processed ( 0.0%),    0 crystals so far. 15 images processed since the last message. Note that the integration radius parameter, which wasn't necessary when using HDF5 peaks (at least at this stage), is now quite important. The first of the three numbers should be roughly the same size as the largest spot in the images, with the other two being a pixel or two larger, but not bigger than half the closest separation between spots in the image. Like before, you needn't wait for indexamajig to finish processing all the patterns, so press Ctrl+C to interrupt it after about 20 images. You just need enough processed images to see whether the peak detection is working properly or not. You should find that the parameters given above are close to optimal for the data in this tutorial, but perhaps you can do better! Simply alter the parameters in the indexamajig command line and repeat until you're satisfied. Read man indexamajig for full details on what the parameters actually do. For a very short summary: make the numbers larger if too many false peaks are found, and make them smaller if too many real peaks are missed. There are also a few other peak search algorithms available: try --indexing=peakfinder8, for example. The other algorithms have more parameters, but can also give better results! To index the patterns for real, you need to run indexamajig again with slightly different parameters. Simply add "--indexing=mosflm". This will tell indexamajig to use MOSFLM to try to index each image. No reference unit cell provided. WARNING: Forcing --no-check-cell because reference unit cell parameters were not given. WARNING: Forcing all indexing methods to use "-nocell", because reference cell parameters were not given. WARNING: Forcing all indexing methods to use "-nolatt", because reference Bravais lattice type was not given. 0 indexable out of    6 processed ( 0.0%),    0 crystals so far. 6 images processed since the last message. 1 indexable out of   10 processed (10.0%),    1 crystals so far. 4 images processed since the last message. 2 indexable out of   15 processed (13.3%),    2 crystals so far. 5 images processed since the last message. 3 indexable out of   16 processed (18.8%),    3 crystals so far. 1 images processed since the last message. 5 indexable out of   20 processed (25.0%),    5 crystals so far. 4 images processed since the last message. 5 indexable out of   20 processed (25.0%),    5 crystals so far. 0 images processed since the last message. 5 indexable out of   22 processed (22.7%),    5 crystals so far. 2 images processed since the last message. 85 indexable out of  186 processed (45.7%),   85 crystals so far. 5 images processed since the last message. 86 indexable out of  187 processed (46.0%),   86 crystals so far. 1 images processed since the last message. 86 indexable out of  189 processed (45.5%),   86 crystals so far. 2 images processed since the last message. 87 indexable out of  194 processed (44.8%),   87 crystals so far. 5 images processed since the last message. 87 indexable out of  194 processed (44.8%),   87 crystals so far. 0 images processed since the last message. 88 indexable out of  195 processed (45.1%),   88 crystals so far. 1 images processed since the last message. 90 indexable out of  199 processed (45.2%),   90 crystals so far. 4 images processed since the last message. 91 indexable out of  200 processed (45.5%),   91 crystals so far. 1 images processed since the last message. The progress will be much slower than in the previous step because indexamajig is now doing much more processing for each pattern — the full indexing and integration. These 200 patterns took about 10 minutes to process on my desktop computer. If you have multiple CPUs, you can increase the speed by adding -j n to the command line, where n is the number of processors to use. Like before, you needn't wait for all 5775 patterns to be processed. About 100 indexable patterns will be sufficient for this step. Note the addition of --int-radius=3,4,5 in the command line. This isn't strictly necessary at this stage if we're using --peaks=hdf5 — it'll only become critical when we get to the final integration before mergng the intensities — but it's good to get into the habit of setting a value here. Notice the warning about "3 implausibly negative reflections". This message appears whenever any of the reflections in the pattern were measured as having an intensity negative by more than five sigma. On statistical grounds, this should not happen by chance more than once in an entire large dataset, so if it happens on one of the first patterns, as it does here, it probably indicates that something isn't quite right. There are a number of possible explanations, such as a misindexed pattern or a bad pixel on the detector. The problematic reflections are automatically filtered out, so you don't have to worry too much unless you see a very large number of warnings. If you see a rhombohedral cell (all axis lengths the same, all angles the same) with an angle of 60 degrees, the lattice might in fact be cubic F.
If you see a rhombohedral cell with an angle of 109.5 degrees, the lattice might in fact be cubic I. If the cell is monoclinic C, you will see at least three different representations of the unit cell, corresponding to the three cell choices. If you're not familiar with this, set sail for your nearest copy of the International Tables volume A, and see section 2.2.16 (in the 5th edition). If the cell is centered (any of A, B, C, F, I or even "H"), you will almost always see at least one primitive cell which represents the same lattice. There are, of course, many other possibilities. In this case, you can see the primitive cell appearing in black, alongside the C-centered cell in purple. Let's proceed with the hypothesis that the lattice is orthorhombic C. Before we make our final determination of the target unit cell for indexing, we can use the lattice type information to clean up the indexing results a bit. This will be done in the next step. If you were very confident about the cell parameters determined in the previous step (or determined some other way), you could skip this step. However, it's better to work through it to make sure everything is working properly. Even though we know the lattice parameters, it's possible to index the patterns in a more consistent way than the previous step without making use of them. Instead, we'll use only the Bravais lattice, i.e. our knowledge that the lattice is orthorhombic C. We won't tell indexamajig about the unit cell parameters themselves, so they will still not be checked for consistency. Save the file as "5HT2B.cell" and run indexamajig again with the additional option -p 5HT2B.cell. Easy! orthorhombic C, unique axis ?. Unit cell parameters are not specified. 2 indexable out of   15 processed (13.3%),    2 crystals so far. 0 images processed since the last message. 70 indexable out of  179 processed (39.1%),   70 crystals so far. 1 images processed since the last message. 72 indexable out of  183 processed (39.3%),   72 crystals so far. 4 images processed since the last message. 74 indexable out of  186 processed (39.8%),   74 crystals so far. 3 images processed since the last message. 74 indexable out of  186 processed (39.8%),   74 crystals so far. 0 images processed since the last message. 74 indexable out of  187 processed (39.6%),   74 crystals so far. 1 images processed since the last message. 74 indexable out of  191 processed (38.7%),   74 crystals so far. 4 images processed since the last message. 75 indexable out of  195 processed (38.5%),   75 crystals so far. 4 images processed since the last message. 76 indexable out of  197 processed (38.6%),   76 crystals so far. 2 images processed since the last message. 77 indexable out of  200 processed (38.5%),   77 crystals so far. 3 images processed since the last message. Once again, you only need to wait for about 100 indexed patterns. This is a good point at which to check and optimise the detector geometry. Even if the geometry file is supposedly correct for the experiment, it's best to check that, for example, the beam position hasn't drifted. Fortunately, CrystFEL has already done most of the work for you. The updated geometry file is called 5HT2B-Liu-2013-predrefine.geom, as the script tells you. Use this geometry file for further processing. Even better geometry refinement can be performed using geoptimiser, but it's much more complicated to use, in fact there is a separate tutorial about it. The advantage of using geoptimiser is that it can refine the panel locations individually. The output stream from the previous step contains patterns indexed almost entirely using a consistent unit cell. However, there is still some "contamination", as you can see in the first line of the list of cell parameters above. This could be due to a second type of crystal in the mixture, but it's much more likely that it's simply a mis-indexed pattern. Before the intensities from the many patterns can be merged, we need to be sure that they're all indexed consistently. You can do this by telling indexamajig the cell parameters which it should match each pattern against. To do this, you need to add the cell parameters to the unit cell file like this:. Note the addition of the cell parameters, which came from the Unit Cell Explorer in step 8. If you have a recent version of CrystFEL, you'll find an option to save the unit cell file directly from cell_explorer, under the File menu. However, make sure you check the contents of the file and apply the all-important crystallographic intelligence! There is no need to update the command line, but this time we'll add -j 4 to multi-process across four CPUs, making things a bit faster. We will also switch to the updated geometry file from the previous step. orthorhombic C, unique axis ?, right handed. Cell representation is crystallographic, direct space. 3 indexable out of   20 processed (15.0%),    3 crystals so far. 20 images processed since the last message. 12 indexable out of   36 processed (33.3%),   12 crystals so far. 16 images processed since the last message. 20 indexable out of   62 processed (32.3%),   20 crystals so far. 26 images processed since the last message. 24 indexable out of   80 processed (30.0%),   24 crystals so far. 18 images processed since the last message. 31 indexable out of   99 processed (31.3%),   31 crystals so far. 19 images processed since the last message. 2311 indexable out of 5578 processed (41.4%), 2311 crystals so far. 21 images processed since the last message. 2317 indexable out of 5601 processed (41.4%), 2317 crystals so far. 23 images processed since the last message. 2323 indexable out of 5625 processed (41.3%), 2323 crystals so far. 24 images processed since the last message. 2330 indexable out of 5646 processed (41.3%), 2330 crystals so far. 21 images processed since the last message. 2335 indexable out of 5665 processed (41.2%), 2335 crystals so far. 19 images processed since the last message. 2344 indexable out of 5687 processed (41.2%), 2344 crystals so far. 22 images processed since the last message. 2351 indexable out of 5713 processed (41.2%), 2351 crystals so far. 26 images processed since the last message. 2353 indexable out of 5736 processed (41.0%), 2353 crystals so far. 23 images processed since the last message. 2358 indexable out of 5759 processed (40.9%), 2358 crystals so far. 23 images processed since the last message. Final: 5775 images processed, 2361 had crystals (40.9%), 2361 crystals overall. This indexing run will produce the results we will merge, so let it run to completion. This is a good time to move your work to a higher performance machine, if you have one available. For example, on a single 32-core analysis node using -j 32, all 5775 patterns could be processed in about eight minutes. Note also the use of the refined geometry file from the previous step. 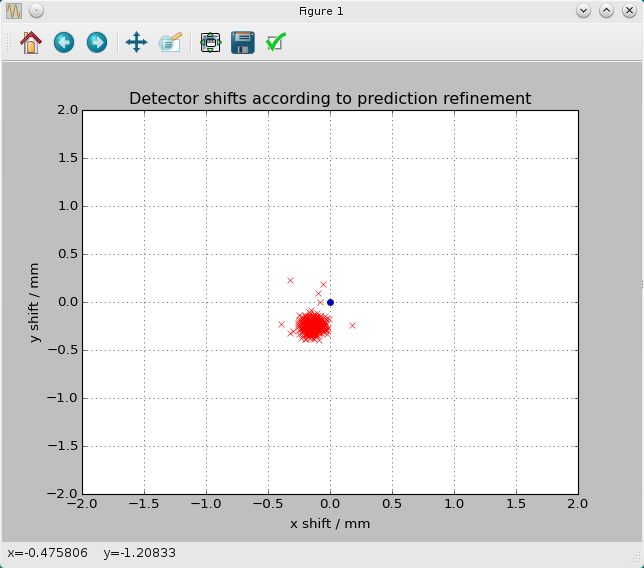 If you were to run detector-shift on the new script, you should see that the points in the scatter graph would cluster around the origin. Try it! The "final" indexing yield in the previous step was 1666 out of 5775, or 29%. This is higher than the figure of 21.5% quoted by the original paper, so we're doing well! The indexing rate could possibly be increased further by using more indexing methods, for example by adding dirax-axes to the list of methods (--indexing=mosflm-axes-latt,dirax-axes). For many situations, it also helps to try MOSFLM both with and without prior lattice type information (--indexing=mosflm-axes-latt,mosflm-axes-nolatt). There are many other possibilities, depending on which programs you have available. The indexing yield depends a lot on the quality of the patterns, and it can seem artificially low if there are many blank patterns (wrongly identified as "hits" by the hit-finder), or many low-quality patterns which are technically "hits" but not reasonably "indexable" or useful in reality. Once indexamajig has finished, you can use the check-near-bragg script to examine the indexing results. This script works exactly like check-peak-detection, except it shows the locations of the peaks that were successfully "predicted" and integrated after indexing instead of those detected by the peak detection. Copy it from your CrystFEL distribution folder, or download it here. Just as before, you can add extra arguments for hdfsee to the command line or edit the script to set your own defaults. Also as before, press Ctrl+C in the terminal from which you ran check-near-bragg to stop the cycle of new hdfsee windows being opened. To evaluate the quality of the indexing, you should try to look for regions in the pattern where there are regular patterns of spots — for example lines, grids or circles — and see if the pattern of predicted spot locations (which are circled) agree with them or not. If the unit cell is small, this can be quite difficult. Don't worry if absent spots are circled at higher resolution, because indexamajig by default integrates reflections all the way to the edge of the detector regardless of the actual resolution limit of the diffraction (this behaviour can be altered if desired by using --integration=rings-rescut, or the high-resolution predictions can be removed at the merging stage). You might notice some trends, such as weaker patterns or poorer peak detection in the patterns which could not be indexed. In this case, you might choose to optimise the peak detection even further. The vertical axis represents the highest pixel value in each reflection and the horizontal axis represents resolution. 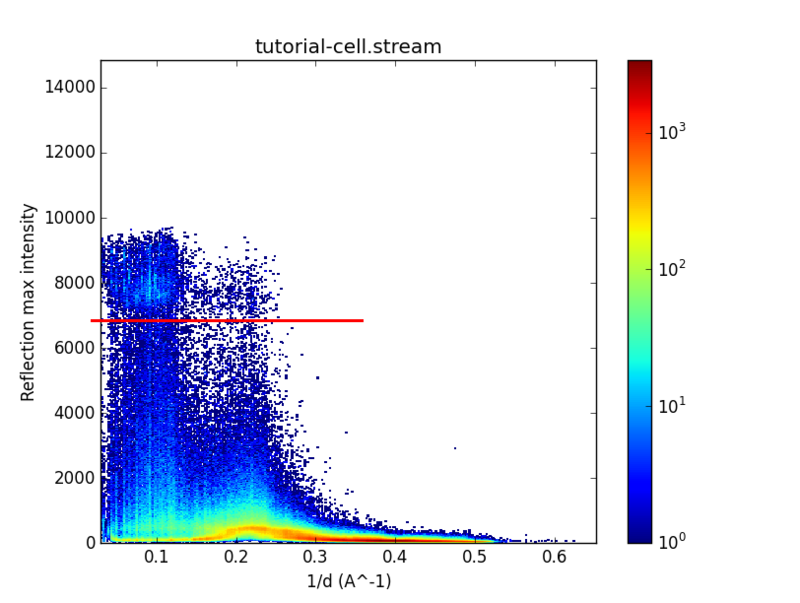 There is one point for every reflection in the stream, and the colour scale represents the density of points in areas where they are very concentrated. The horizontal red line has been added for illustration. See the dense "cloud" of points just above it? Those are the saturated reflections. The density is higher in the cloud because those reflections in fact have higher intensities than the detector can measure, so they appear to have lower values than they should, and get clustered around the maximum value. The reason it's a cloud and not a hard cutoff is that the images have had "pedestal" values subtracted from each pixel, and the pedestal values vary from pixel to pixel, panel to panel and even day to day. You can see, as shown by the position of the red line, that you would have to reject reflections peaking over 7000 detector units. Remember that value for the next step. It's finally time to merge the intensities together! There are two ways to do this: a simple averaging-based ("Monte Carlo") method which will be described in this step, and a more advanced one which will be described in the next step. 5775 images processed, 1666 crystals, 1666 crystals used. Note that the saturation value, 7000, is given using --max-adu. This will generate a new file, tutorial.hkl which contains the merged intensities. It's just a text file — you can examine it with a text editor. The choice of point group, given to process_hkl with -y, was 222 in this example. The space group for the crystal structure in this tutorial is C2221, which means the point group is 222. The symmetry chart has information about indexing ambiguities, which might affect the choice of point group to use for merging. Fortunately, there are no ambiguities in this example. You can append _uaX to the end of any of these point group symbols, where X is a, b or c, to use a different unique axis to the default, which is c for all the point groups where this makes sense. A common mistake is to use -y 2 with a monoclinic unit cell with "unique axis b", CrystFEL will assume that c is the unique axis by default. Use -y 2_uab in that case. 5775 images processed, 2007 crystals, 1003 crystals used. 5775 images processed, 2007 crystals, 1004 crystals used. The two merged half-datasets will be called tutorial.hkl1 and tutorial.hkl2, and will be used in section 14. This step assumes that you're using a recent version of CrystFEL, at least version 0.6.1. Merging algorithms for SFX data are under intense development at the moment. The common aim of all researchers in this field is to model, as accurately as possible, the physics which give rise to the diffraction pattern and then to convert the measured intensities in each pattern directly to the underlying structure factor moduli. The more accurately the diffraction physics can be modelled and corrected for, the more accurate the measurement of the structure factor moduli should be, and hence the fewer diffraction patterns should be required for success in solving a structure. However, this is not easy! Progress has, however, recently been made, as described by Uervirojnangkoorn et al. and Ginn et al. These developments are embodied in the CrystFEL program partialator. partialator implements scaling and post-refinement using a generalised target function, a choice of partiality models, cross-validated residuals and partiality plots, and with no external reference data set. The overall program flow is described in this paper, but some aspects have developed since then, such as the inclusion of scaling in the main refinement instead of as a separate step. Setting --no-pr because we are not modelling partialities (--model=unity). 5775 images loaded, 2361 crystals. Most of the command line looks the same as for process_hkl, with the input stream, output file and symmetry. In addition, you have to specify which diffraction physics ("partiality") model to use (--model=unity), and how many iterations to perform of the refinement procedure which tries to maximise the agreement between the patterns by refining parameters such as the scaling factors, Debye-Waller parameters, crystal orientation and so on. The unity model actually means that no modelling should be done apart from the scaling factors and Debye-Waller parameters, so in this example we are simply performing three iterations of scaling. Nevertheless, this should still improve the data quality, which you will measure in the next step. To try a complete modelling of the diffraction physics, change --model=unity to --model=scsphere. Since the model is now more complicated, it's not as clear that the results will always improve. Your mileage may vary, and feedback is very welcome! Perhaps needless to say, merging using partialator requires much more memory and CPU than using process_hkl. You might want to consider running this step on a dedicated analysis machine rather than your desktop, and of course you can specify -j to increase the speed by running multiple parts of the calculation in parallel on a multi-core machine. Finally, note that you do not need to use alternate-stream when working with partialator, because it will automatically write out tutorial.hkl1 and tutorial.hkl2 for you, each of which corresponds to half the crystals in the dataset. The half-dataset filenames will always be the same as your specified output filename, suffixed with "1" and "2" for the two halves. Use check_hkl to calculate some simple figures of merit. You'll need to provide the unit cell file, which will be used to calculate the values in resolution shells. WARNING; 2 reflections had infinite or invalid values of I/sigma(I). Resolution shell information written to shells.dat. The columns are, in order from left to right: the centre of the resolution bin in inverse nanometres, the number of reflections in the resolution bin, the number of possible reflections (taking into account the point group symmetry and systematic absences due to the centering, but not the systematic absences due to glide planes and screw axes), the completeness in percent, the total number of measurements of all reflections in this bin, the mean number of measurements per reflection, the mean signal to noise ratio, the standard deviation of all the intensities in this shell, the mean of all intensities in the shell, the centre of the resolution bin in Angstroms, and finally the minimum and maximum values of 1/d for the bin in inverse nanometres. Since CrystFEL 0.7.0, you can leave out -y 222 from all check_hkl and compare_hkl (see later) commands. The symmetry you gave to partialator or process_hkl will be used automatically. 44641 reflections rejected because they were outside the resolution range. Note that the completeness is close to 100%, even though the number of patterns is low. check_hkl is telling you that it's measured almost all the reflections at least once, but this doesn't mean that the measurements are useful at all. The estimated standard errors of the intensity measurements, and hence the signal to noise ratio (SNR) is estimated as described in the original CrystFEL paper. The mean and standard deviation columns in the table are the mean and standard deviations of the intensities in the resolution bin. They can sometimes be useful to spot trends in overall intensity. These numbers are not directly related to the SNR or sigma(I) values! Rsplit is quite poor for this dataset, as expected for such a small number of patterns. As a general rule, below 35% is reasonable, below 20% is good and below 10% is excellent, but these are only rough guidelines. tutorial.hkl1: 62396 reflections, resolution range 33.68 to 1.91 Angstroms (0.29691 to 5.24429 nm^-1). tutorial.hkl2: 63012 reflections, resolution range 34.74 to 1.91 Angstroms (0.28785 to 5.23884 nm^-1). 0 reflection pairs rejected because either or both versions did not have Bijvoet partners. 2565 reflection pairs rejected because they were centric. Accepted resolution range: 0.298686 to 5.054949 nm^-1 (33.48 to 1.98 Angstroms). A scale factor greater than 1 means that the second reflection list is weaker than the first. A positive relative B factor means that the second reflection list falls off with resolution more quickly than the first. Not a convincing anomalous signal, as expected for this sample, wavelength and quantity of data. Note that compare_hkl also accepts the --highres argument to restrict the resolution range to one that's sensible for the specific data set. The reflection lists (files ending in .hkl here, but that naming is only a convention) are also plain text, so you can almost certainly import them easily into any crystallographic software. There are scripts in the CrystFEL scripts folder for conversion into MTZ and XSCALE formats: create-mtz and create-xscale respectively. These scripts are templates for you to modify, because you need to set things like the dataset name for the MTZ file, and the space group. Download (create-mtz or create-xscale) or copy the files to your folder and edit them. To force you to edit them first, they won't run until you delete the warning at the top of the script. Note that you must redirect the output from create-xscale to a new file (tutorial-xds.hkl). You can safely ignore the "Unrecognised" messages from create-xscale — these are normal. Congratulations! You've successfully processed a data set using CrystFEL. Now it's time to process your own data. Your next port of call should be the manual pages, which contain comprehensive information about all of the command-line options. You should also read the best practice guidelines, which should now mostly make sense to you.